San Francesco di Paola, or Saint Francis of Paola, was born in Paola, on the coast of Calabria, on 27 March 1416; at 12 years old, he took the Franciscan habit. In 1430, he began living as a hermit in a secluded, inaccessible location, where he later founded the Order of the Minims in 1435. The order's rule of extreme austerity was formally approved by Pope Alexander VI. The Saint's life is replete with supernatural events, including one that took place in the Strait of Messina, where, upon being refused passage by a boatman, the Saint stretched his tattered cloak over the water and crossed the sea, setting sail on his own. This is his most famous "miracle", known as the crossing of the Strait of Messina and this is why he is considered the patron Saint of Italian sailors. In 1483, he went to France, by order of Pope Sixtus IV, to try to heal King Louis XI. Though he could not restore health to the dying King's body, he was able to soothe his soul, helping him to die in peace. Moved by his lifestyle, many devout Franciscans, Benedictines, and hermits also joined him in France, where he died in 1507, at the age of 91. 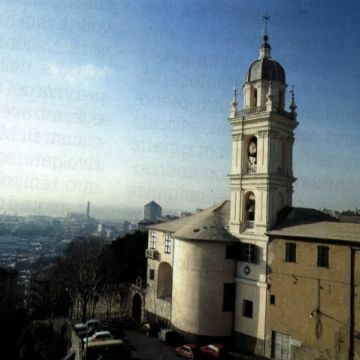 Historical records reveal that in 1483, during his journey to France, San Francesco di Paola stopped in Genoa as the guest of Doge Battista II Fregoso. The Saint stayed several days in the city and was celebrated by the people and the nobility, especially the Doria family, who later became protectors of the Minim friars, who thus became commonly known as "The Friars of Prince Doria". 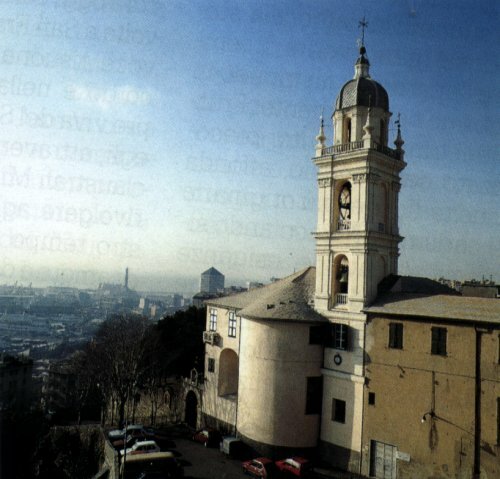 During his stay, the Saint set his gaze on a hill called Caldetto which overlooks the city and harbour in the west and exclaimed: "Up there, to please God, we will soon have a monastery dedicated to Jesus and Mary." In 1427, Ludovico Centurione bought a house and land on the site so that the monks of San Francesco di Paola could build their monastery. Thanks also to protection from the Doria and the Balbi families, by the second half of the 16th century the Sanctuary already appeared in its current form, featuring three naves with a large frescoed cloister. Annexed to the Sanctuary is the Monastery of the Minim Friars,, home to a collection of votive offering. The feast: by tradition and by decree of Pope Pius XII, San Francesco di Paola is the patron saint of sailors. For this reason, vessels entering the port from the east would once greet the Sanctuary with a volley of gunshots. Every evening at dusk, the "bell of the sea" rings, commemorating sailors lost amid the waves. The feast of the patron saint of Italian seafarers, the sailing community and maritime workers is celebrated on the first or second Sunday of May, with religious services, a naval parade, and costumed performances. At the end of the naval parade, the Cardinal Archbishop bestows a blessing on the town and the harbour.